The folks at the Common Application announced the five essay prompts students will choose from to write their core essay for the coming college admissions “season.” I’m sharing them below. In general, I think they improved upon the options, and the prompts will elicit more interesting and meaningful college application essays. Bravo Common App! If you are just starting this process, don’t even need to bother to know what the old ones were. Just focus on understanding these new ones. For those in the college admissions industry who watch these changes as closely as I do, here’s a look at the new prompts, in a nutshell. 1. Some students have a background, identity, interest, or talent that is so meaningful they believe their application would be incomplete without it. If this sounds like you, then please share your story. Same as last year, except they added three other categories (identity, interest and talent), which should make this even a more opened-ended prompt than before. In other words, you can almost write about anything you want, similar to the previous “Topic of Choice.” This is good news. They want your stories! 2. The lessons we take from failure can be fundamental to later success. Recount an incident or time when you experienced failure. How did it affect you, and what did you learn from the experience? This is almost exactly the same, except for the additional sentence that encourages the writer to make sure to describe the failure and what was learned, and also how that experience led to a more basic or core success for that student. A minor, but nice addition. 3. Reflect on a time when you challenged a belief or idea. What prompted you to act? Would you make the same decision again? Same as last year. 4. Describe a problem you’ve solved or a problem you’d like to solve. It can be an intellectual challenge, a research query, an ethical dilemma—anything that is of personal importance, no matter the scale. Explain its significance to you and what steps you took or could be taken to identify a solution. I LOVE this brand new prompt! (And they nixed the old one about the place where a student was “perfectly content,” which I found led to some dull essays.) To me, this prompt is begging for a story, which are THE BEST for these essays! If you have a problem, and then share how you dealt with it, you will tell a story. I write about that all over this blog and in my guide books! And stories are engaging and the perfect way to reveal meaning, character, intellectual vitality, all that good stuff. Also, when there is a problem, something happens—which makes the essays more interesting to write and read! I especially love the part that emphasizes that this problem just needs to have “personal importance, no matter the scale.” To me, this means it does not need to be impressive, and even an everyday (mundane) problem could produce a terrific essay. And with any personal statement essay like these, the more “personal,” the better. Way to go Common App! College admissions counselors around the country will want to kiss you this year. RELATED: I love this new prompt so much I made a video tutorial on How to Answer Common App Prompt 4. It’s free! 5. Discuss an accomplishment or event, formal or informal, that marked your transition from childhood to adulthood within your culture, community, or family. Same as before. Not a favorite of mine, but it worked really well for students who came from challenging personal backgrounds that forced them to “grow up” and assume adult responsibilities and admirable qualities early in life. Provoked some powerful essays. So that’s it! At least for now. If I were just starting, I would read all these prompts and see if one resonates with you, or inspires an idea or story you like. I believe Prompt One, Two and Four can evoke the best narrative (story-telling style), slice-of-life college application essays—but go with whichever one works for you. Watch my video tutorial on How to Answer Common App Prompt 4 and get a head start on your essay now! Check out my Jumpstart Guide to get started. 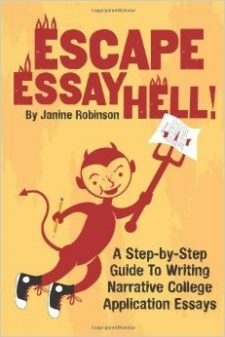 If you want to learn all the various ways I can help you with your college application essays, check my HelpFinder, which spells out everything from my video tutorials to my writing guide books on Amazon to my online course and private tutoring. Great resource! I’ll recommend your course to a student I’m working with. You say “get a jump start” I assume you mean for the 2016-2017 academic year application window since this article is published in March of 2015. I guess this means that the 2015-2016 essay prompts are expected to remain the same for at least another year? I can’t imagine a change after I read of their review process! But there’s tons of anxiety among parents who suspect it’s not wise to start writing yet? Seems smart to me!! Will comb through your site. Great work! Those essays are really helpful for me and thanks!